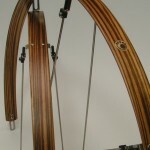 Local craftsman Paul Sykes hand makes these stunning wood fenders. Some are made from recycled wood from skateboards! Your bike will be the classiest on the block, guaranteed.